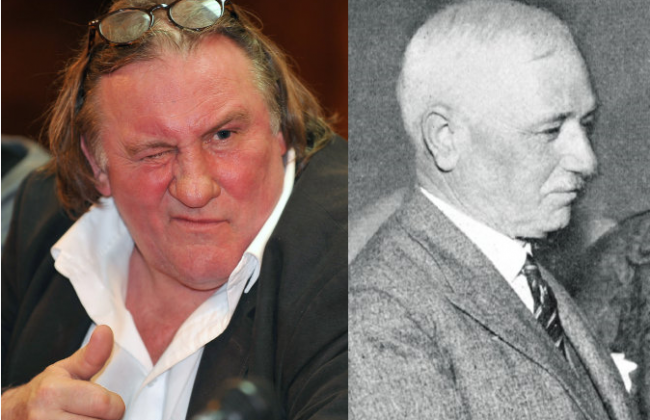 Good news for fans of horrible miscasting in that everybody’s favourite plane-piddling Gallic thesp Gerard Depardieu is to play former FIFA president and World Cup creator Jules Rimet in a new film about the inception and history of football’s governing body. Why, they could’ve been separated at birth. Depardieu’s casting is almost certainly nothing to do with the fact that the French actor has been an ever-present, hanging on the shoulder of Sepp Blatter at almost every FIFA-related gala/award show/Single n’ Ready To Mingle Motown Night over the past year. According to Reuters, the film – tentatively titled “F2014” and which “aims to uncover the human story of the creation of the largest sports federation in the world” – is being written by novelist Jean Paul Delfino and director Frederic Auburtin and is due to start shooting in June of this year. Just a suggestion, but if they need help with the casting of Sepp Blatter at all, Pies recommend that the producers save a bit of cash by just drawing facial features on a turnip with a biro. Jesus wept. Not even trying anymore. Who’s this fat snail-munching pig?